"This past September, 2014 officially entered the record books as the year with the most new condominium completions. In fact, completions in the first nine months of 2014 surpassed the previous year’s record of 16,668 units. By the end of October this year, there were 20,684 new condominiums completed across the GTA in 91 developments. And an additional 18 projects are scheduled to be completed in the next weeks before the end of 2014, bringing the estimated completions total for the year to about 25,000 units. It’s a record-setting year that has been nearly a decade in the making. The extraordinary condo growth is largely the result of intensification policies introduced by the province back in 2005. Places to Grow, the official growth plan that re-focused building and development on intensification, triggered a chain of events that have been working their way through the system — and the housing market in particular — ever since. Those intensification policies have created a new normal for the GTA housing market: more highrise housing and less lowrise. 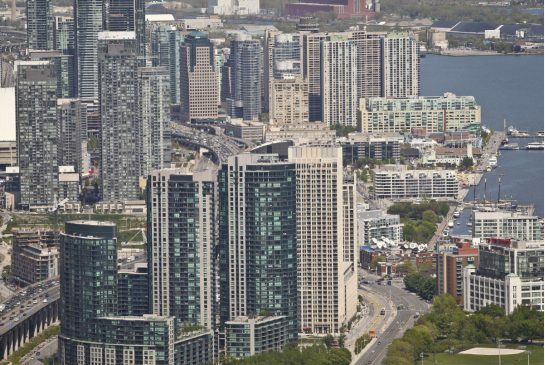 And condominiums are playing an increasingly important role in the overall GTA housing market, offering a steady supply of affordable homes and much-needed rental accommodation. While 2014 will enter the record books as a milestone year, many more scheduled condo completions lie ahead. With 219 projects currently under various stages of construction across the GTA, an additional 52,732 new condominium units are scheduled to be delivered to the market over the next four years. Naysayers needn’t worry about all this new supply: 86 per cent of those units are currently pre-sold." Source: George Carras President RealNet Canada Inc.